Handmade products that provide ethical local employment for women in an area where no other industry existed. Thimble is a group of women from Talahena on the western coastline of Sri Lanka. This little fishing village is on a narrow stretch of land between the Indian Ocean and Negombo Lagoon. The only industry is fishing and there is no work for young women, many of whom are often sent away to work as domestic help in the Middle East. Indira Tibblin saw the need for a local industry that would train and employ women and Thimble began. The women now work from a purpose built workshop housed in a new building designed in the style of the traditional Dutch Sri Lankan houses with a central courtyard that provides ample natural light and captures the cooling breezes from the lake. 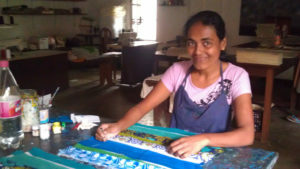 She has created an ethical business based on Fair Trade principles that’s sole purpose is to create job opportunities for the local women and training in new skills. Here they make a range of hand-painted and stitched cards, gifts and Christmas decorations. 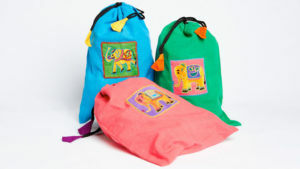 They also sew our gift bags and range of laundry bags and suit bags for Eco Hotels in Australia. 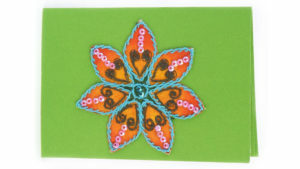 Hand-stitched and painted green flower card by Thimble.